They had never had it so good. 'There is no need of garrisons in the cities, because in each one the greatest and most powerful of the citizens act as Rome's guardians. . .. The masses are protected from the powerful ones by the authority of Rome, so that rich and poor are equally contented and equally benefited.' This amicable concord was part of the system that Roman rule had built up in the provinces. The wealth became concent trated in the hands of a few leading families. These were Rome's friends; they acquired Roman citizenship and, like Aristides himself, two Latin names; and local government was firmly placed in their hands. They did not always exert their powers for the benefit of the whole community. Those who wielded power in the cities must often have been torn between two conflicting ambitions - to use the public funds to make their cities more impressive, or to enlarge their own private fortunes. We occasionally read of popular indignation against magnates who contributed too little for improvements or entertainments in their cities; and though public works and spectacles were not the only legitimate objects of expenditure, the surviving remains and inscriptions of the cities are often a good index of the social conscience that prevailed. - the fire brigades would develop into well-organised political clubs. On the other hand the practical emperor, who was so much concerned with waterways, was gready interested by the Nicomedians' project of cutting a canal to connect their lake by locks with the sea. In Bithynia we see the evil effects of the Roman system. By way of contrast, the public buildings and civic munificence of the cities of the south coast of Asia Minor cannot fail to excite our admiration. The cities there had handsome shopping avenues flanked by broad side/walks under the shelter of colonnades. They had grand theatres and vaulted stadiums, ornamental gateways, and monumental buildings inside the wall circuit. Here, as in the leading cities of Ionia, Aelius Aristides' sermon is not belied; and granting that the southern cities have been fortunate in the chances of survival, it seems nevertheless true that the very ruins of a place like Pamphylian Perge amount to more than the magnates of Nicaea ever erected. At the neighbouring site of Aspendus, which was never a city of much consequence, a theatre over 300 feet across was built out at the foot of the citadel hill in the second century after Christ; made of local stone by a local architect, it has successfully withstood time and the elements; and only the loss of the marble facing of the stage background mars the clean lines of the original construction. Haifa mile away, the ruined aqueduct, with its single tier of arches, still courses for many hundreds of yards across the plain. As it approached the citadel, the water was piped up to a tank raised on arches 100 feet above ground level, and from there it was carried by normal flow into the town. Cyprus and Phoenicia flourished under Roman rule. Egypt, won from the Ptolemies, was the emperor's special domain. Never at rest, Judaea blew up in the time of Hadrian. South of the Dead Sea, in the region of the rift valley that extends to the Gulf of Akaba, the wilderness had once been awakened to agricultural and industrial life by Solomon. 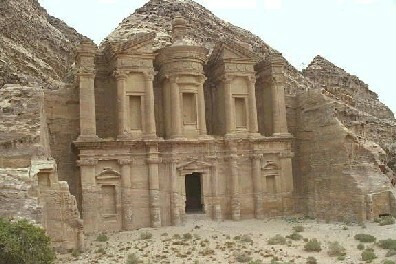 After the time of Alexander the Great it was brought to life again by the Nabataean Arabs, who commanded the caravan routes centring on Petra and by their works of water conservancy made the desert habitable. Allied to Rome, they were only brought inside the Empire in ad 106. Coele Syria between the Orontes and Jordan valleys belonged to the Ituraean Arabs and had relatively little urban development. But in Roman times a colony was formed at Ba'albek, whose Greek name was Heliopolis (City of the Sun); and here on the watershed between Lebanon and Antilebanon a huge sanctuary was built. In terms of sheer acreage, weight of stone, dimensions of individual blocks, and the amount of carving, this precinct can scarcely have had a rival in the GraecoRoman world. The sacred enclosure of Ba'albek measured about 300 yards in length, the whole forming a great platform. At the east end stood a propylaea between two towers, approached by a stairs-way 150 feet broad. Inside this was a hexagonal forecourt giving access to the main temple court. The latter was surrounded by a colonnade, behind which the wall was diversified by alternating semicircular and oblong bays fronted by columns. The west side of this court was closed by the great temple of Baal, which was 100 yards long and stood on a podium 45 feet high. A row of half a dozen columns 65 feet high still stands in position, and the entablature over them is elaborately carved; but so little else remains of this gigantic structure that the visitor is left wondering whether it was ever more than a fragment. Alongside this podium a smaller temple was erected at a lower level; and this second building, itself no smaller than the Parthenon, is still standing almost intact. Its spacious interior is articulated by engaged Corinthian columns; they carry a complete entablature on which the ceiling rested, and between them were arched and gabled niches which will have enshrined statues of deities. Finally, outside the precinct stood a little temple which consisted of a circular cella entered through a normal porch. This little building shows some architectural subtlety; the outer columns of the rotunda carried a lunate entablature which helped to take the thrust of the dome; and the capitals, cut with five sides to conform to the unusual design, reproduce on a smaller scale the arcs of the entablature above. The architects employed at Ba'albek were no doubt skilled in their profession; indeed, the neighbouring city of Damascus produced the most famous architect of Trajan's reign. The workmanship at Ba'albek was equal to the best of its time; and the architectural facades will have been enlivened by innumerable statues in the niches. Yet the sheer opulence and endless repetition of the same motifs of imperial baroque induce in the spectator a feeling of satiety. The Roman world was incomparable in its engineering; but in its artistic sensibility, as in its taste for food and literature, it had a unique immunity from any feeling of indigestion. Magnificence was an end in itself, irrespective of what might lie behind; and it is characteristic of Roman imperial architecture that the same grandiose facade, with its ornate composite or Corinthian order and two/storeyed bays and niches, could with scarcely any modification serve for a gateway, a theatre scene, a city fountain, a public library, or simply as a screen to exclude the outer world.